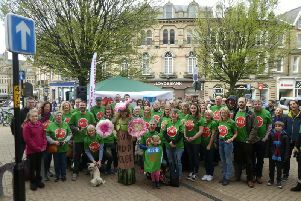 Wetherby in Bloom have finished a significant project in the town centre to mark their 30th anniversary celebrations. Leeds City Council gave permission for In Bloom to renovate the location of the HMS Ceres commemoration anchor near the Cluster of Nuts car park. Plans were drawn up by Chairman Margaret Dabell for a scheme of sustainable planting of trees and shrubs with the addition of some bee friendly perennial plants. Leeds City Council provided topsoil but the site proved a challenge for volunteers as it had previously been used for car parking. turf and now provides an eye-catching focal point for visitors to the adjacent car park and coach drop-off point. Wetherby in Bloom will hold a Day of Memories in Wetherby Town Hall on Saturday June 29 with cake and a cuppa available. A commemorative plaque will be unveiled in the Cluster of Nuts garden at 10am on the 29th.